Minister of Population and Environment Jaya Dev Joshi and Officiating Chairperson of the Parliamentary Committee on Environment Protection Man B Bishwokarma jointly launched three NAP reports on June 5. 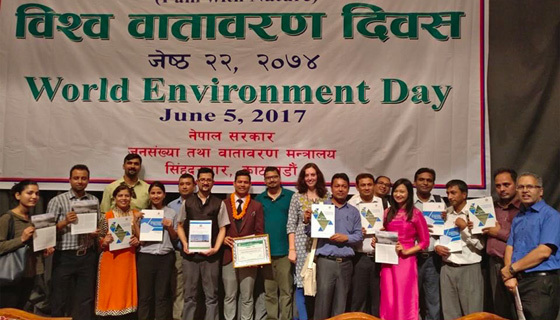 Nepal’s Minister of Population and Environment Jaya Dev Joshi and Officiating Chairperson of the Parliamentary Committee on Environment Protection Man B Bishwokarma jointly launched three reports prepared as part of the National Adaptation Plan (NAP) formulation process in Nepal at an event organized by the Ministry of Population and Environment (MoPE) on June 5 to celebrate World Environment Day 2017. The Support to Rural Livelihoods and Climate Change Adaptation in the Himalaya (Himalica) initiative of the International Centre for Integrated Mountain Development (ICIMOD) contributed substantially to the NAP process. To facilitate integration of climate change adaptation, in a coherent manner, into relevant new and existing policies, programmes, and activities, in particular development planning processes and strategies, within all relevant sectors and at different levels, as appropriate in Nepal. ICIMOD reached an agreement with MoPE—the focal ministry anchoring the National Adaptation Plan (NAP) process—in 2016 to provide technical expertise and support to the NAP consultation process, as well as capacity building and regional exposure. 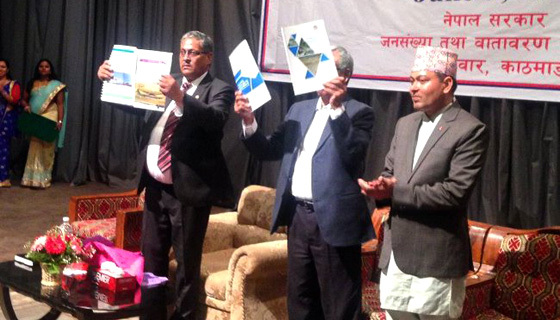 The NAP process in Nepal is a joint effort of the government of Nepal and development partners. Practical Action, ICIMOD, CARE Nepal, and World Wildlife Fund (WWF) have been supporting the government formulate the NAP. Accordingly, Himalica has been providing support to four out of nine thematic sectors of the NAP process: 1) Forest and Biodiversity, 2) Water and Energy Resources, 3) Gender and Social Inclusion, and 4) Livelihood and Governance. Himalica has also supported work on climate trends and scenarios for all the nine sectors of the NAP process.